your patio just as throughly as your den. It can really be a lot of fun, too. Don't be intimidated. Just think of it like you would any other room in your home. The first thing to do is settle on a color scheme. 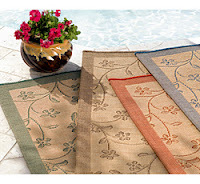 You can pick a pillow, or vase, or any other object with favorable colors, to work from. You may even want to get some fabric samples to work with. Keep in mind stationary colors, such as the color of your home, or shutters. Don't be afraid to use bright or bold colors. You want this to be a comfortable and inviting place your your whole family. It is also a great place for entertaining. Decide what you would like to incorporate in your outdoor room, such as a cooking area. Outdoor kitchens are great, and it will add to the value of your home, as well, which could be very helpful in the future, should you decide to relocate. Once you have established a color scheme theme, you can start shopping for ideas. Since you will be spending a lot of time in your outdoor room, take your time. Do a lot of window, or web, shopping, before you buy. There's a lot to choose from. It's good to start out with a floor covering. Once you have a good sealer on th e floor, get an area rug. A good one will be mildew and mold resistant, and have UV inhibitors. They come in a variety of colors, and shapes. If you have beautiful or unique flooring, get a couple of accent rugs. If your deck is not attractive, get a full sized rug. or a dining set. Try to envision exactly what kind of entertaining you will be doing. Be sure not to crowd your space. You want your outdoor retreat to flow freely. 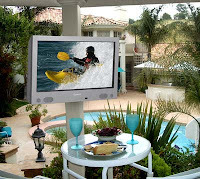 An outdoor television is a relatively new idea. Not many homes have one, but they can really add a lot to your patio. Another great conversation piece is a fire pit. There is a wide variety, to choose from. In addition, you can design your own! Everything is so 'DIY' these days. 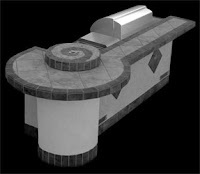 You can buy your own parts, build the surround yourself, out of materials used on your deck, and call a professional to connect it. It is the easiest way to tie everything in. A fire pit, or a patio heater will also lengthen the outdoor living season. The next thing to think about is lighting. You don't need it to be as bright as indoor lighting, so don't get carried away. All you really need is a soft glow. You may want floor lighting, or overhead lighting, or both. The best way to use overhead lighting is to use a pergola. Pergolas are a lot like an arbor, or trellis, in that they use lattice. It's great for wrapping, or hanging lighting, or anything else. A pergola will allow you to close off one side of your patio, which may be a good idea, if you are working in a small space. Pergolas are offered in a variety of wood, vinyl, fiberglass, and other materials. Vinyl is nice because there is virtually no maintenance. A quality vinyl pergola will come with a twenty year warranty. Vinyl may not compliment your design style. 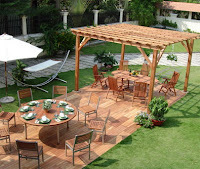 A wooden pergola may suite your patio better. They should also come with a substantial warranty. You may need to stain them, from time to time. They will also be a little heavier, so make sure, if you are putting it on a deck, that you have enough support. Some pergolas are metal. Metal gives a very classy look. You will definitely want to seal those, every couple of years, for the best life. The bottom line is, there is a pergola for most any budget. After you get your main fixtures, you can just decorate, like you would inside your home. If you have partitions, hang outdoor clocks, and thermometers. The main point is, just have fun. You will be so glad you did. Your own private retreat will be just a few steps away. You will be able to enjoy what you thought only the rich and famous were allowed to have. There's nothing like the sanctuary of your own special place. Share your decorating tips with everyone! Pergolas are typically adorned with vines, but don't feel limited. Use your imagination. So many accessories are available for outdoor living. Treat it like you would a wall in your home. Hang a few planters. Bring in a rug, some outdoor lamps, and your outdoor kitchen and bar, and you are all set. There's nothing like it!